The ninth edition of the Superkarts! USA Pro Tour took the green flag at NOLA Motorsports Park in Avondale, LA on Saturday, beginning the three-weekend, six-race championship schedule. 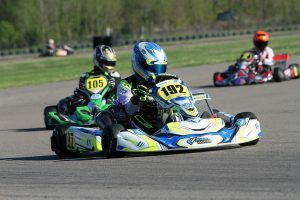 NOLA’s facility is one of the finest in the country, and in utilizing their 17-turn, 1.1-mile layout, SKUSA has offered up at least eight overtaking opportunities for their drivers. The entry list hit 212 competitors by race time, spread over the nine categories. The racing was clean overall, with a few black marks for certain, but for the most part, NOLA once again delivered impressive competition. It’s been four years since Austin Garrison won the SKUSA Pro Tour S2 Semi-Pro Stock Honda in 2014, and the Formula Works CompKart driver starred in his S1 Pro rookie debut, avoiding an early race incident that collected a few of the frontrunners before going on to pass TB Kart USA’s AJ Myers for the win. Rolison Performance Group’s Pedro Lopes (Kosmic) was also on his game to win the S2 main event. In X30 Senior, RPM’s Jake Craig (Tony Kart) showed why he is one of the absolute best in the sport, stretching away on the rear bumper of Christian Brooks (CRG) before assuming the lead to take the win. Aluminos drivers Jimmy McNeil and John Crow scored the S4 Master and Super Master wins, while Phil Giebler Racing’s Jess Peterson (Birel ART) stood on top of the X30 Master podium. Matheus Morgatto (Parolin) overcame the tremendous competition to win in X30 Junior, while Jeremy Fletcher (Tony Kart) and Caleb Gafrarar (Parolin) scored their first SKUSA Pro Tour WinterNationals wins in Mini Swift and Micro Swift, respectively. 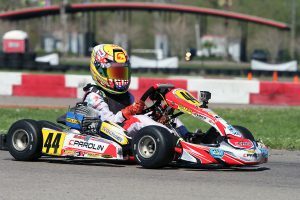 Parolin, Aluminos and Tony Kart can both boast of a pair of Pro Tour wins in the opener, while single victories were carded by Kosmic, CompKart and Birel ART. Forty-four drivers lined up for the X30 Senior division on the day, all looking to be the star of Round One to begin as the championship leader. 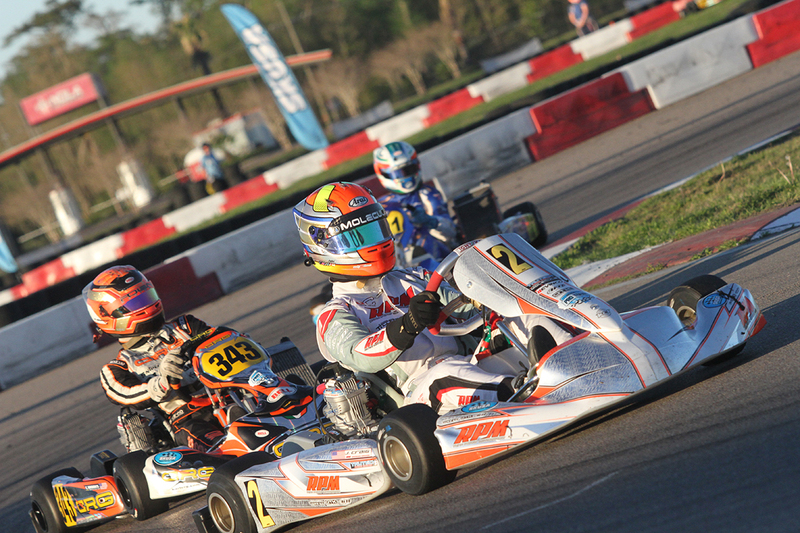 Experience proved to be the key with the top drivers on the day with a number of years on the SKUSA Pro Tour. Not exactly a SKUSA veteran, Argentinean Jorge Pescador (Praga) set the pace through qualifying and the Prefinal, establishing himself as the driver to beat. SKUSA veterans Jake Craig (Tony Kart) and Christian Brooks (CRG) put themselves in as the drivers to contest Pescador’s bid to be a SKUSA Pro Tour winner. Brooks led for the first half of the Final until Craig took over the position near the halfway point. The top three ran nose to tail, measuring up each other. The strategy played into the favor of Craig, with Brooks unable to pressure enough for the lead and Pescador hanging on to keep with the top two. Craig laid down the consistent laps in the end to repeat as a WinterNationals winner and put himself out front as the victory, holding on to a two tenths victory over Brooks, who scored a third straight runner-up finish at the WinterNationals. 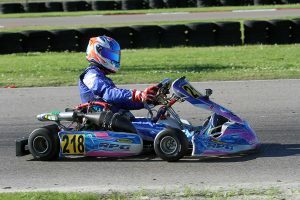 Pescador rounded out the podium with Canadian Samuel Lupien (Kosmic) and Nicky Hays (Birel ART) completing the top five. As we stated in the preview, the S1 Pro Stock Honda division was going to be close. Qualifying put the top six within a half of a tenth when the checkered flag fell, with former SuperNationals winner AJ Myers (TB Kart) setting the fast time. Myers continued as the top driver through the Prefinal, challenge by SKUSA #2 plate holder Billy Musgrave (Aluminos). Defending champion Jake French (Sodikart) joined at the end, setting up for a three driver battle in the Final. Myers and Musgrave mixed it up in the early stages of the main event, triggering a chain reaction when shuffling for position. French got airborn over the curbs off turn two, sending him sideways on the exit and the rest of the field avoiding him. It took out a number of contenders, putting Musgrave back to sixth and Myers out front with Austin Garrison (CompKart) now as the lead challenger. Sizing up Myers, Garrison took the lead on lap 12 and never looked back. In the closing laps, Myers came under challenge from a charging Musgrave. The two went back and forth, giving Garrison enough room to reach the checkered flag first in his S1 debut. Myers held off Musgrave for the runner-up spot with S1 rookies Kyle Wick (CRG) and Rory van der Steur (FA Kart) rounding out the top-five. The battle for the top spot in the S2 Semi-Pro Stock Honda division seemed to be up for grabs each session. Rookie Pedro Lopes (Kosmic) set fast time in qualifying with Blair Hosie (Alpha) setting the pace in the Prefinal. Both were joined by Matt Paesch (CompKart) and Cameron Egger (Kosmic) in the final with the four locked together. Hosie led early until Paesch took a turn at the point before Lopes secured the lead. The Brazilian S2 rookie fought Paesch in the final circuit, with the two drag racing to the checkered flag. Lopes hit his shift points correctly, reaching the checkered first by seven thousandths of a second over Paesch. Egger took the final spot the podium over Hosie with Tyler Guilbeault (DR Kart) placing fifth. The day looked to belong to Jordon Musser in the S4 Master Stock Moto category. The two-time defending Pro Tour champion had his sights on a perfect score for the opening round after setting fast time in qualifying and pulling away to the win in the Prefinal. After losing the holeshot to 2016 champ Ryan Kinnear (Sodikart), Musser was quick to retake the top spot in the main event. Musser was out to a solid lead until he was given the meatball flag for a detached rear bumper. Forced to pull off and relinquish the top spot, former series champion Jimmy McNeil (Aluminos) took over as the lead after taking a position away from Kinnear. McNeil held on to the finish to secure the victory, his first on the SKUSA Pro Tour since his last championship season in 2015. Kinnear, the 2016 champion, finished second with SKUSA #3 plate holder and privateer Ben Schermerhorn (Birel ART) in third. Evan Batt (TB Kart) and Nathan Stewart (Soidkart). made up the top-five. Today was the first SKUSA Pro Tour victory for veteran karter John Crow (Aluminos). Crow was in the hunt from the start, securing fast time in qualifying before placing behind SuperNationals winner Mike Jones (Sodikart) in the Prefinal. Crow was awarded the win after a false start penalty was handed to Jones, taking his win away and dropping him down the order on the main event grid. Crow led all 20 laps to secure his first Pro Tour victory with Jones giving chase ahead of two-time defending champion Robert Marks (CRG). Victor Jimenez (Tony Kart) was fourth in his S4SM debut with Nick Firestone (DR Kart) completing the top-five. The top of the order in X30 Master was an international affair. Brazilian and former SuperNationals winner Renato David (Birel ART) set fast time in qualifying before fellow countryman Paulo Lopes (Kosmic) came away with the Prefinal win. 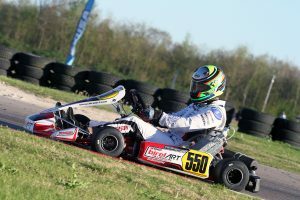 A large lead group formed in the Final with three-time SuperNationals winner Leonardo Nienkotter (CompKart) setting up as the lead challenger. Nienkotter attempted a pass in turn eight. The two made contact, with Nienkotter going off with damage while Lopes continued. 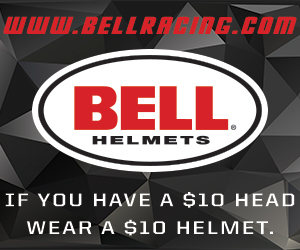 This gave the lead to Jess Peterson (Birel ART) with the two-time SpringNationals winner leading the rest of the way for the victory. Peterson drover to a near half-second victory over two-time SKUSA Pro Tour champion Derek Wang (FA Kart) with Lopes rounding out the podium. Travis Irving (CompKart) held on with a broken seat strut to finish fourth ahead of David. The X30 Junior race went down to the wire with Mexican driver Matheus Morgatto scoring a big win for Parolin. Morgatto started out the day coming up just short for fast time in qualifying as SuperNationals winner Tyler Gonzalez (Tony Kart) secured the pole position for the Prefinal. A four driver fight was won by Canadian Justin Arseneau (Tony Kart) with Gonzalez and Morgatto right there. The 20-lap main event was wild, with multiple lead changes and the race coming down to the final circuit. Nepveu was leading with Morgatto in second. A deep move in turn eight gave Morgatto the lead, and the fighting for second behind him gave enough breathing room in the final corners to reach the checkered flag for his first SKUSA Pro Tour triumph. Arias Deukmedjian (Kosmic) slipped past Nepveu for second with Jeremy Fairbairn (Tony Kart) in fourth and Arseneau taking fifth. The Mini Swift category was the only division to bring out a red flag on the day. Karts were everywhere on the opening circuit at turns four and five, including last year’s SKUSA Pro Tour Micro champion Elliot Cox (Energy) on his head. Kai Sorensen (Benik) was also involved, needing some medical attention before standing up and getting out of his kart. On track, the day was led by some veterans with IAME International Final winner Brent Crews (Nitro Kart) setting fast time in qualifying before defending SKUSA Pro Tour champion Carson Morgan (Benik) won the Prefinal. Neither had a chance at the victory in the Final, thanks to James Egozi (Tony Kart) and Jeremy Fletcher (Tony Kart) teaming up and pulling away from the field. Once that put enough distance between them and the pack racing for third, they began to size each other up. Fletcher ended up getting the advantage, winning the drag race to the line over Egozi for his first SKUSA Pro Tour victory. Morgan ended up third while Jace Park (Parolin) knifed his way up from 32nd to fourth after losing a battery in the Prefinal and coming up underweight at the scales. Anderson Leonard (Benik) was fifth with Crews in sixth. An amazing performance was put in on the day by Caleb Gafrarar in Micro Swift. The Parolin driver came from 10th after getting shuffled off in the grass at the start from the outside row one position. The top qualifier was edged out by Cooper Shipman (Benik) in the Prefinal to put him on the outside lane for the start of the Final. Once Gafarar settled back into the field after his off track run, he began to go to work. By the halfway point, he was into the third spot, working on cutting into the gap Max Garcia (Beink) and Ethan Ayars (Parolin) had established. Once there, he put himself into the lead but Garcia was not done. The Florida driver took the lead back from Gafrarar as they went down the long back straight. Gafrarar set him up for a great run through turns three and four, retaking the position. Garcia came back in the final corner, and the two went side by side. At the line, Gafrarar scored the victory by 58 thousandths of a second. 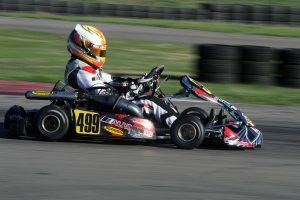 Ayars was a close third, earning his first SKUSA Pro Tour podium finish. Ben Maier (Nitro Kart) also had issues at the start, coming from the tail of the field to end up fourth with Graham Trammell (Kosmic) in fifth. Be sure to follow complete coverage of Round Two of the Superkarts! USA Pro Tour WinterNationals at ekartingnews.com/live with play-by-play coverage provided by Rolison Performance Group, KartSport North America and Courtney Concepts, live from the Cooper Tire Tower.